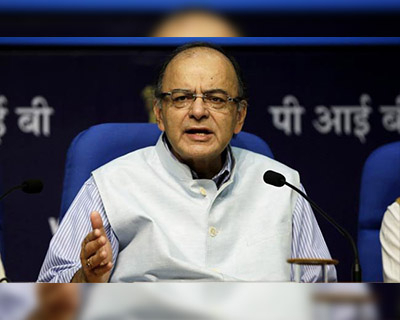 Union Finance Minister Arun Jaitley on October 1 announced that the Central Board of Direct Taxes (CBDT) has received total disclosures of Rs. 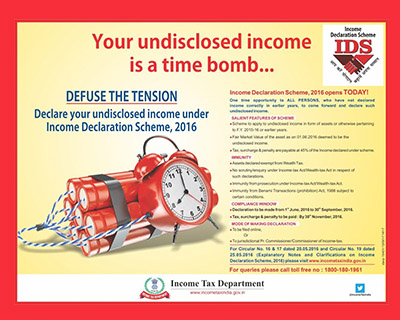 65,250 crore under the Income and Assets Disclosure Scheme, 2016. The four-month window under the scheme for declaring undisclosed income that had escaped assessment closed on September 30. Knappily assesses the success of the scheme and explores the way forward for recovering India’s ‘black money’. What has the government announced? Finance minister Arun Jaitley announced that the Central Board of Direct Taxes (CBDT) has received total disclosures of Rs 65,250 crore black money from 64,275 declarations under the Modi government’s black money declaration scheme, which was open for four months since June 1 and closed on September 30. He said the number is expected to go up once all the declarations are verified. Based on the current declarations, the Centre is likely to get tax revenues of Rs 29,362 crore based on 45 percent tax requirement, of which Rs 14,700 crore will flow into its coffers by March and the rest in the next fiscal year. Jaitley said the money will go to the Consolidated Fund of India and will be used for public welfare. However, the FM refused to give any more specifics of the scheme’s findings, including the states which have contributed most and the size of the black money collected for individuals, citing the confidentiality promised in the scheme. It is also not clear how many of these declarants are total non-tax payers or the sectors they do business. Note: The Income and Assets Declaration Scheme (IADS) had provided a one-time opportunity to black money holders who had not paid full taxes in the past to come clean by declaring their domestic undisclosed income and assets by paying tax plus penalty at the rate of 45 per cent. Under this scheme, people with undisclosed income can legalise their money (or possessions acquired using unaccounted money) by paying a tax of 45% (30% tax, a surcharge of 7.5% and penalty of 7.5%). 'Declarants' using this route would be immune from prosecution under the Income Tax Act, Benami Transactions (Prohibition) Act and Wealth Tax Act. Why was this scheme successful? The declarations are seen as a major success for the government when compared to the earlier scheme Voluntary Disclosure of Income Scheme of 1997. Under VDIS, 1997, if assets were shown as having been acquired before 1987, their value as on April 1, 1987, was considered, and a 30% taxes was imposed. The value of gold and silver had almost doubled in Assessment Year (AY) 1997 compared to April 1, 1987, and it was simple to take a valuation certificate from 1987 and pay what was in effect a 15% tax on it on March 31, 1997 — without any interest or penalties. The scheme attracted 4.75 lakh declarations, of which 3.09 lakh pertained to jewellery and other movable assets.VDIS 1997 was like an off-season sale of branded goods at 50% discount with a lifetime guarantee (immunity from prosecution). The 2016 Income and Assets Declaration Scheme, however, is said to be not an amnesty scheme as it does not give 50% to 100% discount on the tax liability of the dishonest. While they do carry reasonable discounts on interest and penalty, taxes are payable at more than normal rates. The tax payable is 45%, i.e., 15% more than the normal tax rate of 30%. This includes a penalty of 7.5% and surcharge of 7.5%. Opportunity is given at a little extra cost to avoid further interest, penalty or prosecution under the Income Tax Act, 1961, and the Benami Transaction (Prohibition) Act, 1988. 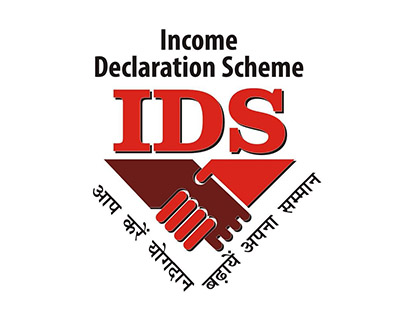 This scheme has brought smaller declarations (64,275), but the average declaration under IADS worked out to Rs 1 crore per declarant, suggesting that the scheme fared better despite a stiffer rate of 45%. Moreover, since the tax rate was 45%, and the fact that the fair market value of declared assets has been taken as on June 1, 2016, there was no room to manipulate and pay less tax like in VDIS, 1997. Thus, an opportunity was given to taxpayers to escape prosecution creating a win-win situation for both them and the government — but the dishonest have not been rewarded for their dishonesty. When was the first such amnesty scheme launched by India? There have been 11 prominent tax amnesty schemes since independence. The first voluntary disclosure scheme, VDIS Tyagi Scheme, was announced in 1951, wherein assessees were allowed to declare their unaccounted funds without attracting any penalty or prosecution under tax laws of that time. This drive managed to collect taxes of just Rs. 11 crore (on Rs 70 crore worth of income declared) as tax evaders were not confident about the assurances of immunity. In 1965, there were four major amnesty schemes. The government was short of money after the war with China. The four schemes managed the disclosure of Rs. 285 crores (approx.) worth of income. In 1997, the government launched Voluntary Disclosure of Income Scheme (VDIS). The government managed to collect Rs. 9,729 crores of money, the largest since independence and hence it was touted as the most successful. Where is the next challenge? While the government has indeed progressed on black money hunt to a larger extent, the bigger point is that the government should now crack-down on the guilty with all might, besides making it clear that such schemes are not going to be a continuous exercise. Else, this can send a wrong signal to the honest taxpayers, something experts have warned in the past. The government must initiate punitive follow-ups now that the amnesty scheme has ended. Defaulters who have not availed of amnesty benefits should be hunted down and punished. 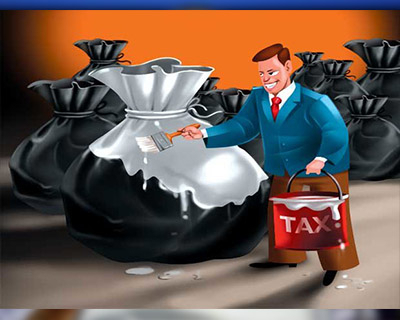 Further, the government should not announce any more tax amnesty schemes, as by doing so the government is creating a 'moral hazard', where even honest taxpayers would be intuitively encouraged to wait for an amnesty scheme to declare their income.Tax amnesty schemes, according to Madan Sabnavis, chief economist at CARE Ratings, is like rewarding the tax evader's dishonesty. Both the Justice K N Wanchoo Committee in 1971 and the Shankar Acharya Committee in 1985 had pointed out the ill-effects of announcing black money voluntary declaration schemes unless there is a compelling reason to do so. “Resorting to such a measure during normal times and that too frequently, would only shake the confidence of the honest taxpayers in the capacity of the government to deal with the law breakers and would invite contempt for its enforcement machinery,” the Wanchoo panel had said in 1971. These measures will bring about higher compliance levels, and leave a message that the dishonest will be punished severely and not be rewarded through regular amnesty schemes. Who did the NDA government have a similar scheme for last year? The government announced a 90 days amnesty-like window for foreign black money holders charging them 60 percent tax. The Act under which the scheme was announced is known as the ‘Black Money and Imposition of Tax Act, 2015 (Undisclosed Foreign Income and Assets or the UFIA)’ became effective from July 1, 2015 with the starting of the one-time compliance window until October 1, 2015. Black money in the form of undisclosed foreign income and assets comes under the purview of this law. The UFIA Act gives an opportunity to the black income holders to reveal black money and pay a tax within a compliance window time. A total of Rs 4,147 crore of undeclared wealth was declared by 644 declarants and the government garnered Rs 2,500 crore from the whole exercise, a paltry sum considering the kind of black money stashed abroad. The government said black income holders will come under severe penal and prosecution measures prescribed under the law. 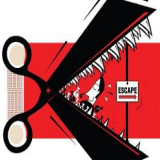 The black money law makes hiding wealth overseas a criminal offence attracting up to 10 years of rigorous imprisonment and 120% tax, effectively leading to confiscation of the asset. 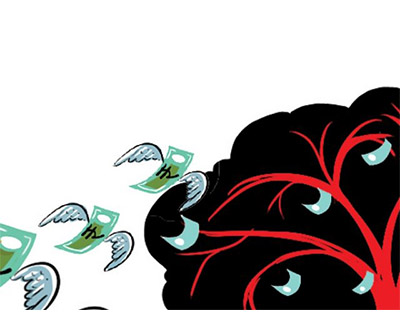 The law is a cornerstone of the government's crackdown on black money. 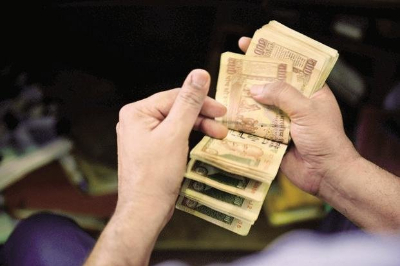 How has the government been trying to curb black money? In the 175 cases of black money allegedly stashed overseas in HSBC bank accounts, the CBDT has already filed 164 prosecutions following assessments of sums that add up to Rs 8,000 crore. The probe is being monitored by the Special Investigation Team (SIT), set up under the directions of the Supreme Court. Following the leads from the investigations undertaken by the International Consortium of Investigative Journalists (ICIJ), the CBDT has detected Rs.5,000 crore of undisclosed deposits in foreign accounts made and filed 55 prosecution cases in those cases. 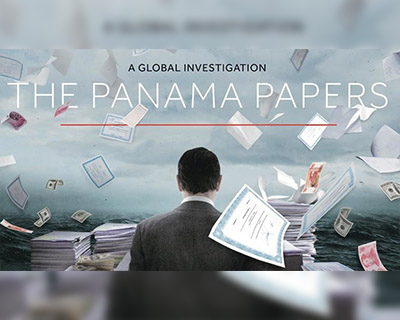 Similarly, investigation in the Panama cases has led to 250 references being made to other countries asking for details about tax evaders, bank accounts etc. A quantum jump in the searches and survey has resulted in the seizure of Rs.1986 crore as well as undisclosed income of Rs.56,378 crore in the last two and half years. Upgradation of information technology (IT) capabilities of the tax department has led to non-intrusive methods of detection of evasion. By more intensive monitoring of the database of non-filers of tax returns, the CBDT realised Rs.16,000 crore in additional tax collection. Cases of prosecution and compounding in the last two and half years rose to 3,626.